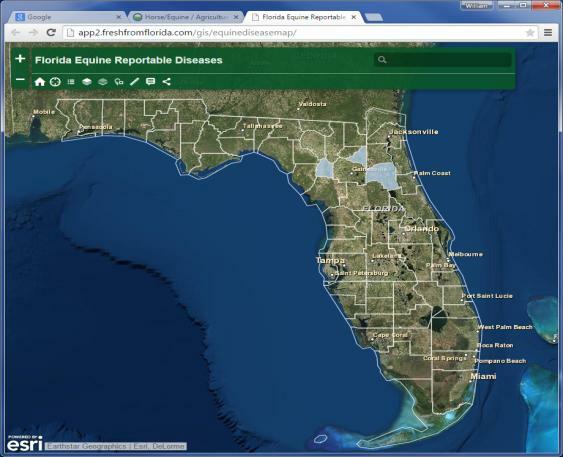 The Florida Department of Agriculture and Consumer Services has released a new webmap to track equine diseases. Florida’s Equine Reportable Disease Map is an interactive way to look at disease occurrence within the state. Disease information can be viewed by county, with monthly and calendar year information available. The map uses Geographic Information Systems (GIS) technology to visualize the data and allows veterinarians, horse owners, and others in the industry to identify at-risk areas. This information can then be used to assist with disease prevention strategies to better protect Florida’s horses. 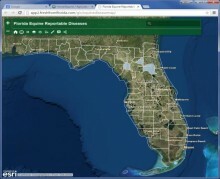 The Equine Reportable Disease Map can be viewed at http://www.freshfromflorida.com/Divisions-Offices/Animal-Industry/Agriculture-Industry/Horse-Equine/. The map will be updated frequently and will be current on the first day of each month.